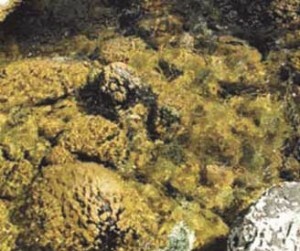 Freshwater algae that attaches to rocks, plants, or other stable underwater surfaces and can form large ‘blooms.’ Brownish yellow to white in color; colonies or mats of didymo look like sewage sludge or wet tissue paper. It appears slimy, but to the touch it feels like wet wool. 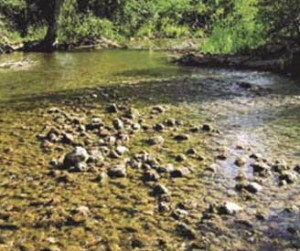 Shallow waters of freshwater streams and rivers; sunny open areas with stable water flows of moderate to high current; and below outlets of lakes and reservoirs. Not known to exist in Nebraska. Found primarily in streams in Western states and some in the Northeastern states. A single cell can multiply to form new colonies. Spreads by attaching to boats, trailers, and other equipment like fishing and diving gear and waders (especially neoprene and felt-soled waders). ‘Blooms’ out-compete other stream organisms, such as aquatic plants, insects, and trout. Its range is expanding and forming growths in streams and the potential impacts on new waters is a concern. Economic impacts include fouling of water pipes and a potential link to a decline in fisheries. The growths become snagged in fishing gear and make swimming areas unappealing.